I decided to put this under the “Classic Favorites” category because I do consider Oreo cookies and chocolate chip cookies to be both classic and favorites. If you disagree, you know how and where to find me. I’ll win, by the way. I ALWAYS WIN. But can you imagine these two together? Can you imagine them Sumo wrestling and then deciding they didn’t feel like fighting anymore and just wanted to hug forever? If you can, you should probably keep reading, because I like your style. 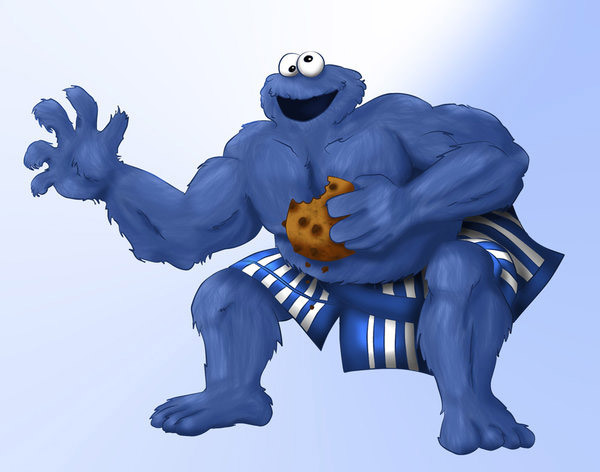 This is what happened when I Googled "sumo wrestling cookies." You're welcome, readers. A few months before I started this blog, my friend Anthony posted a link on Facebook that caught my eye. It caught my eye because it was basically a link to a world of greatness, of wonder, of amazing ideas. About an hour after viewing the recipe for Oreo-stuffed chocolate chip cookies, I was whipping butter with sugar and laughing maniacally at what would become the treat that would cause my boss to proclaim, with a massive grin, “that thing was lethal. In a good way. But lethal.” Let’s do this thing. Now, as I’ve mentioned before, I have my own chocolate chip cookie recipe that I’ve spent years developing, so I only really used the link above as a go-ahead to do very bad things to Oreos. You’re free to use whichever recipe you please, and to be honest, the finished products in this link do look am-ahzing. Below is my personal recipe, which also kinda rules ;). *So the crime-scene title is inspired by some CBS procedural drama that decided to start filming on my block. This I find uncool, mostly because I assume they’re going to film the scene of the “incident” at the heart of the episode on my street, making it seem like I live in a sketch ‘hood. I mean, I kind of do, but why’s the rest of the world need to know that? Preheat your oven to 350ºF. In a medium-sized bowl, sift together flour, baking soda and salt. In a separate larger bowl, cream together butter and sugar until fluffy. Beat in the egg, then the vanilla until smooth. Then stir in the flour mixture and combine until a batter is created. Fold in your chocolate chips and get ready to get hands-y with this. Before we get to pictures, I should apologize, since this isn’t my best effort photography-wise. In all fairness, I had a guest over for dinner while I was making these, and didn’t want to be rude, hence the hasty snapshots. I’m also just kind of lame. Let these blobs be a lesson to you: refrigerate your dough, folks. So, if you’re not into getting at least a little bit messy, this isn’t the recipe for you. 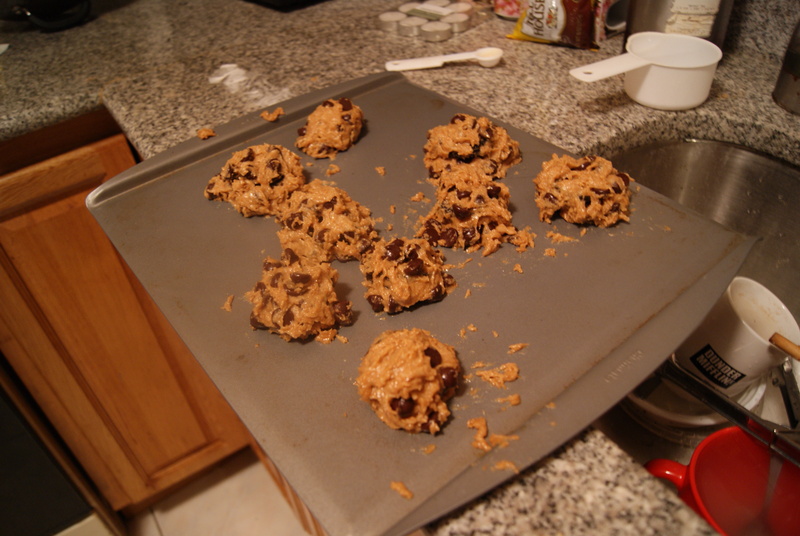 Then again, if you’re not into getting a little bit messy, you picked the wrong site to bum around on, because I am all about the hot mess cookie process. 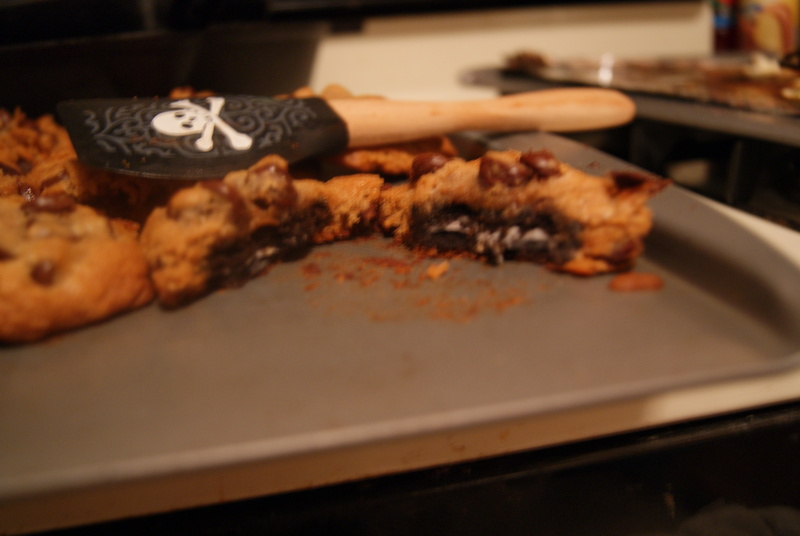 Ohhh…the hot mess cookie. Future post, perhaps? Anyway, with clean hands, grab a handful of cookie dough and start covering an Oreo with it. Try to get the entire Oreo hidden so that it appears you’ve got plain ol’ jumbo cookies on your baking sheet. While working on these cookies this time around, I discovered something that might make the rest of you decide to rename me Captain Obvious: you should really refrigerate the cookie dough for about 20 minutes before working with it. Otherwise you’ll end up with about 40% of the dough stuck to your fingers, and your dinner companion will laugh at you, not be impressed by you. This absolutely did happen to me. When you’ve got yours covered, send them into the oven for 10-12 minutes, until the tops are golden-brown. Right, so, as you can see, these cookies spread a little bit. More like a lot. 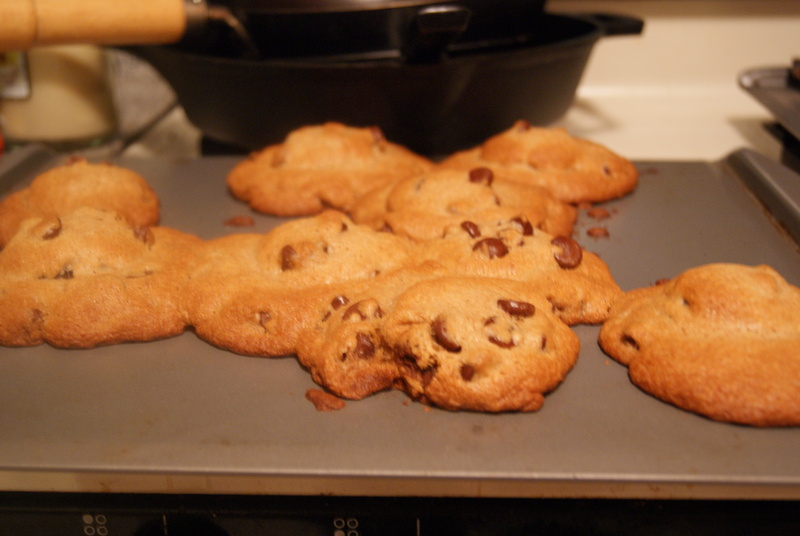 Basically, don’t be like Shibow, sloppily plopping jumbo monster cookies haphazardly onto a baking sheet. Leave a bit of space so that you don’t end up needing to use your awesome skull spatula, given to you by a lovely and deeply-missed former coworker named Julie (thankyouthankyouthankyou! ), to wedge these apart. Cross section (plus rad spatula!). Apologies for blurriness. Bottom line: these are just as crazy delicious as you think they are. They’re also as big as my head. Need I say more? Oh, one last thing: with Halloween coming up and my patience waning, I thought I’d ask for suggestions on what to masquerade as. Last year, I was Emo Lady Waldo, which is basically just Lady Waldo with a name tag that reads “Maybe I just don’t want to be found. Ever think of that?” That costume set me back five bucks, which is exactly how much red duct tape costs. I am creative. This year, I was thinking of either being a flapper, something random that I find at Target, or Waldo again. For the flapper outfit, I have a suitable dress, I just need a cheap boa or something, in keeping with my new tradition of using items I already own as costumes. By the way, should I be worried that I’m able to use so many of my everyday clothes as Halloween attire? And is there an awesome costume I’m not considering but should be? Ooooo. I did this with peanut butter cups and it was amazing. I bet Oreos would be great too! Peanut butter cups!!!! Genius. Definitely my next project if I don’t gorge myself on the Reese’s first.